Manufacturer & Supplier of Servo System & Fuji Servo System. Our product range also comprises of CNC Controller, CNC Machine Control Panel. We offer our clients an optimum quality range of Fuji Servo System which are manufactured at vendor's end using the advanced technology in compliance with the set industry standards. Owing to their long service life and easy maintenance features, these systems are widely demanded among our clients. Furthermore, to ensure the best quality, the provided systems are stringently tested by our quality auditors against various quality parameters. 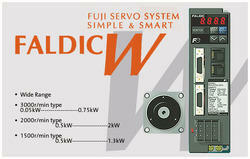 The Faldic Series keeps evolving to meet all market requirements.